In order to earn money online through affiliate marketing you need to learn how to find a profitable niche. Our first task at hand is to find out what a niche is and then we can search for one that we believe to be profitable. 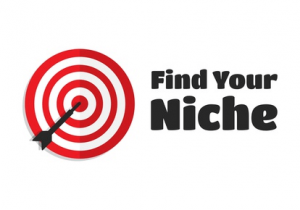 When we talk about niche in relation to affiliate marketing we are referring to a very defined portion of a market. This narrowed down market will have a certain group of people who are looking for a solution to a specific problem. Following is an example. Dog Training is a market but it is a very large market. You want to narrow it down. So after some research you come up with training dogs for the blind. So your niche would be specifically training dogs for the blind instead of just dog training. Your targeted audience would be dog trainers who train dogs to become guide dogs or maybe a blind person looking for a seeing eye dog. This is not the greatest example but I hope you get the idea about what a niche is. If you are going to start an online business you need to be prepared to create a lot of content. So when you are searching for your niche you should start with topics that interest you. Maybe you have a couple of hobbies that you really enjoy so writing about them would not be that difficult. You should also take a look at some of the evergreen niches. The evergreen niches consist of niches that people will always be looking for some type of information about. They are not a passing fad or are they seasonal. Maybe you have some health issues that you could write about. Sharing information on how you have dealt with your health issues may help someone else in their struggle against the same disease. After you have made your list the research begins. Take a good look at your list and pick out what appeals to you the most. Creating a site about something that you are passionate about will overcome many obstacles. One of those obstacles would be coming up with the content for your site. To be truly successful your site is going to be a lot of work and a lot of content, so being passionate about your topic will help immensely. So now that you have an idea on what you want your website to be about what’s next? Is This Niche Profitable ? The next thing you need to do is find out if your niche will actually make you money. Even though your main goal is to help people you still would like to make some money while helping them so you need to find out if your selected niche is profitable. To find out if people are even interested in your selected niche you will need to do some keyword research. So just as an example let’s say we have decided to do something in the Weight Loss niche. Obviously weight loss in itself is way too broad. So you can go to Google’s free keyword tool and type in weight loss. I prefer to use the keyword tool at Wealthy Affiliate since that is what I am use to. After typing in weight loss I came across the keyword weight loss for women. The competition was higher than what I am comfortable with so I decided to dig down further. After digging down further I came up with weight loss for women over 50. Since I am over 50 I could relate to this keyword. It had a good number of searches and low competition. Next I would take the keyword that I have decided on and type it into the search bar and see what kind of sites do come up on the first page. Now I need to decide whether or not I can compete against those sites. Can I beat them out for a top spot on page one of Google? To determine this you should check the age of the site, is the keyword in their title, is the keyword used in their meta description. Little things like this will help you maybe rank better than them. Also if all the sites on page one of Google are very popular well ranking sites you may need to look for another keyword. Now that you have done the research and the keyword is good to go we need to take a step back. We know that there is going to be an affiliate program for weight loss since weight loss falls under the evergreen niche of Health. If however you have decided on a more obscure niche we probably should have checked if there were any affiliate programs available and that we would be eligible for before doing all of our research. So if you haven’t already checked now would be the time to do so. 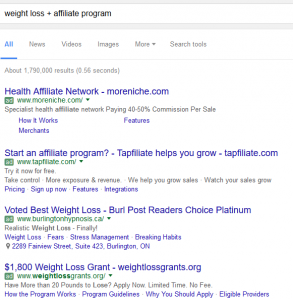 All you need to do to check is type in weight loss + affiliate program in the search bar. So now that you have found your niche the real work begins. First you will need to set up your website. Many people who have an online business use WordPress for their site. There are many themes that are free and there are many themes that you can pay for. For now if you are just starting out I would stick to a free theme. What you do next is a subject that deserves its own space. If you would like to learn more about how to find a profitable niche you can always head over to Wealthy Affiliate. Wealthy Affiliate has been around for a very long time and you can actually join for free. All that is needed from you is for you to take action. 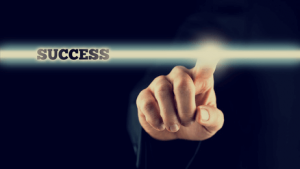 Let Wealthy Affiliate start you on your journey of success. After all Success Equals Freedom! Hello. I would like to build a business on the internet and think about starting a blog, but until now I did not know what a niche is and what to choose. But it’s good that your post has answered my questions. Thanks to you, I know what niche I will choose. Thanks and I will continue reading your other articles because I can learn a lot of interesting things. Hi Michael Thanks for dropping by. I am glad my site was able to help you with your niche. Choosing a niche is very important because that’s where everything starts. Good luck with your online business and if you have any questions remember you have a whole community to reach out to. Thanks for explaining this properly. I know a lot of people, myself included who struggle to find a profitable niche. Some niches are really impossible to break into due to how competitive the market really is. I tried to break into the gaming niche once, and I could never rank for any variation keyword, believe it or not, I tried everything, and there were already 30 other high authority sites ranking for every phrase I could think of. I do think it is important to find narrow areas of a niche, and try to compete for the lesser competitive areas within it, but also to be sure that people are looking for answers within that certain sub-niche. Hi Jacob Thanks for your input. You are not alone in the struggle of finding a profitable niche. The recommendation of following your passion is a good one since you are more likely to know the ins and outs of the niche which will allow you to really drill down into the micro niche area. Also if it is your pasion you will know what people are looking for. Good luck with your site! Great article on finding a profitable niche. My passions probably lie in the “evergreen” category as it is called as in making money online niche and the weight loss niche. Heading towards 50 I know I can target people more my age as opposed to it just being a weight loss site. But I will definitely do my research to make sure it is profitable and worth my time! Hi Sharon Thanks for dropping by my site. Finding a niche is not really that hard but finding how to approach the profitability of the niche is where the difficulty comes in. You make a good point with the weight loss niche. You could have a weight loss site that would be very broad or as you suggest you could drill down to weight loss for people around 50. Much more specific targeted audience. If that is your audience it will be easier to relate to. Good luck with your internet business. I’m in two minds whether or not to go for a profitable niche or simply stick to the niche I have a passion for (which is not that popular or profitable at the end of the day!). I think I would struggle writing for a profitable niche whilst I would find it a lot easier writing about my hobby. What are your recommendations on this? Hi Chris Since your passion is not profitable you could add adsense ads or other contextual ads to make money with your site. The information in your article is very clear and concise… keyword research is often times over-looked. Most marketers I’ve spoken to seem to think keyword research is very unattractive. However, I beg to differ… with the right research tools keyword research can be a very intriguing process. From what I’ve read… Jaaxy appears to be a great newbie friendly research tool. That said, are you totally satisfied with the results you get from using Jaaxy? Thanks for your comment Mark. Keyword research is definitely the start to your website. Get it wrong and you are wasting a lot of valuable time. Jaaxy is a wonderful research tool and gives great results. The WA keyword research tool is also good. 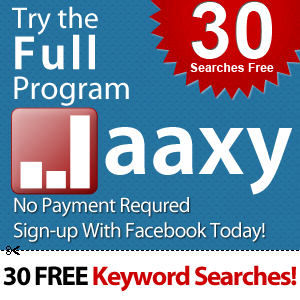 It doesn’t give as much info as Jaaxy but it gives enough to be a very good keyword research tool also. Hey, this is a great recap of one of the most important factors of making money online. Writing content is great, but to make money online people have to factor if there are products to promote. And how profitable would promoting these products be. A great niche is one where you can become an authority in. A profitable niche is one where you can make a lot more money, while still becoming an authority. Thanks for the comment Medu. You can usually find an affiliate program to sell just about anything online today. Finding one that pays a good commission and sells frequently is the key. I think when you do find that product to promote you will become an authority on it as you write more and more content. Of course having a genuine interest in the product will help immensely for you to becoming an authority on the product.